There are several saints called Jude, but the Saint Jude who is venerated by this parish (together with Saint Simon) is Jude the Apostle. According to tradition, Saint Jude preached with Saint Simon in Persia, and suffered martyrdom with him. In the stained glass windows in our church (see picture above), Saint Jude is shown holding a ship. He is regarded as the patron saint of desperate and lost causes, because he is said to have written the Epistle of Jude, which encourages the faithful to persevere despite harsh, difficult circumstances. There are also several saints called Simon, but "our" Saint Simon is Simon the Apostle, also known as Simon the Zealot. Saint Simon's name has caused even more confusion than Saint Jude's over the years, as there are several saints called Simon and of course Peter the Apostle was previously called Simon, too. Simon the Apostle is a different person from Peter the Apostle and from Simeon the Apostle. The writers of the Gospel and the Acts of the Apostles had this problem, so Simon the Apostle is often called by different names in order to distinguish him from Saint Peter. 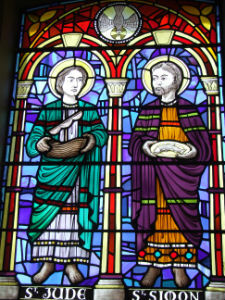 In the stained glass windows in our church (see picture above), Saint Simon is shown holding a fish. Saint Simon is the patron saint of tanners, curriers, and sawyers. Pope Benedict XVI preached about Saints Simon and Jude on 11 October 2006, which you can read here: Please click on this link for the document and article.